VANCOUVER, April 27, 2018 /CNW/ - Filo Mining Corp (TSXV, Nasdaq First North: FIL) ("Filo Mining", "Filo", or the "Company") is pleased to announce results of the first batch of drill holes from the recently completed 2017/18 drill program at the Filo del Sol project in San Juan Province, Argentina and Region III, Chile. A total of 9,411 metres was drilled during the program, which was completed at the end of March. Assay results for 20 reverse circulation (RC) holes are presented here, and the remainder will be released once the final assays have been received. In total, 31 RC holes and 9 diamond drill holes were completed during the program. Commenting on today's results, Adam Lundin, CEO of Filo Mining stated, "We are very pleased with the initial results from our 2017/18 drill season. We expect to convert a large portion of our inferred oxide resource to indicated, which was one of our primary objectives this season. The remainder of drill results will be released in Q2 of this year, followed by a resource update in Q3." One of the main goals of the 2017/18 drill program was to convert a part of the inferred oxide resource to the indicated category and most of the holes in this release were drilled for that purpose. The results suggest that we are well on our way to achieving this objective. The resource remains open laterally and to depth, and several other holes were drilled adjacent to the inferred resource in order to test for resource extensions. The holes in this release span a distance of 2.5 kilometres from VRC141 in the south to VRC153 in the north. Fourteen of the holes announced today were drilled into the Filo zone of the deposit. Three of these (VRC136, VRC137 and VRC153) intersected mineralization outside of the 2017 resource limit, including extensions to the copper-gold oxide zone in VRC137 and VRC153 and to the hypogene zone in VRC136. Four holes (VRC137, VRC148, VRC150 and VRC155) intersected the gold oxide zone. Three of these gold-oxide zone intersections were in areas of inferred resource while VRC150 drilled through the indicated part of the gold oxide zone on its way to deeper inferred blocks in the underlying copper-gold oxide and silver zones. All of the Filo zone holes intersected the copper-gold oxide zone, with the exception of VRC136 which started west of the Frontera fault and VRC151 which was stopped above the zone due to excessive hole deflection. All of these copper-gold oxide intersections are either within the inferred resource or adjacent to it. Eight of the holes intersected the silver zone, including some high-grade intervals in holes VRC135, VRC152 and VRC155. In particular, VRC152 encountered an 8 metre section between 310 metres and 318 metres which assayed 726.3 g/t silver. These silver zone intersections are all along the edge of the indicated resource or within the adjacent inferred resource. Six of the holes presented here were drilled into the Tamberias zone. Three of these holes (VRC140, VRC142 and VRC144) extend the gold oxide zone beyond the 2017 resource limit. 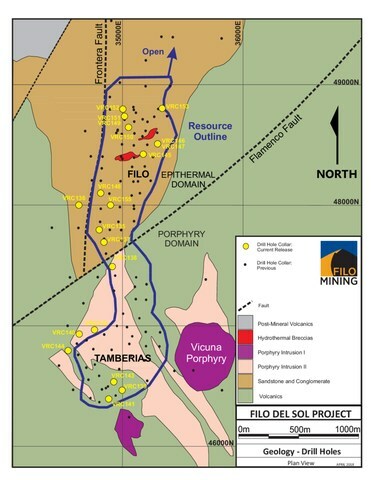 The other three (VRC139, VRC141 and VRC143) were drilled into the Tamberias copper-gold oxide zone either near the edge of the indicated resource or within the inferred resource and will allow for conversion of some of the inferred resource. A full table of the drill hole intersections, collar information and a plan map showing the locations of the drill holes are included within this release. The results of the 2017/18 drilling will be incorporated into an updated mineral resource estimate to support the Pre-Feasibility Study ("PFS") which is currently underway. Diamond drill holes completed during the program will contribute data for the resource update and will also provide samples for metallurgical testwork forming an important part of the study. Metallurgical sample material was also collected from surface trenches during the field program. The PFS testwork program is being carried out at SGS Minerals metallurgical lab in Lakefield, Ontario and commenced in early April, 2018. Ongoing environmental and social programs continue in support of the PFS and to lay the groundwork for future environmental assessments and project permitting. Mineralized zones within the Filo del Sol deposit are flat-lying, and drilled widths are interpreted to be greater than 95% of true widths. The field program was carried out under the supervision of Bob Carmichael, B.A.Sc., P.Eng., who is the Qualified Person as defined by NI 43-101. Mr. Carmichael is Vice President, Exploration for the Company and has reviewed and approved the technical information contained in this news release. Samples were collected at the drill site by Company personnel with splitting carried out at the Company's field camp near the drill sites. Individual samples represent final splits from 2 metre intervals down the hole. Samples were delivered to the ALS preparation laboratory in Copiapo, Chile where samples were crushed and split and a 500g split was pulverized to 85% passing 200 mesh. The prepared samples were sent to the ALS assay laboratory in Lima, Peru. ALS is an accredited laboratory which is independent of the Company. Gold analyses were by fire assay fusion with AAS finish on a 30g sample. Copper and silver were analysed by atomic absorption following a 4 acid digestion. Samples were also analyzed for a suite of 36 elements with ICP-ES and a sequential copper leach analysis was completed on each sample. Copper and gold standards as well as blanks and duplicates (field, preparation and analysis) were randomly inserted into the sampling sequence for Quality Control. On average, 9% of the submitted samples correspond to Quality Control samples. This information is information that Filo Mining Corp. is obliged to make public pursuant to the EU Market Abuse Regulation. This information was submitted for publication, through the agency of the contact person set out below, on April 27, 2018 at 2:00 a.m. Toronto time. The Company believes that the expectations reflected in the forward-looking information included in this press release are reasonable, but no assurance can be given that these expectations will prove to be correct and such forward-looking information should not be unduly relied upon. This forward-looking information speaks as of the date of this press release. Forward-looking information in this news release includes, but is not limited to, statements regarding the Company's expectations with respect to conversion of inferred mineral resources to indicated mineral resources, timing for receipt of additional assay results, an updated mineral resource estimate to support a PFS, the assumptions used in the mineral resource estimates for the Filo del Sol project; expected timing with respect to completion of a PFS, expectations with regard to potential for adding to mineral resources through exploration; estimations of commodity prices, mineral resources, and costs. Forward-looking information is based on certain assumptions that the Company believes are reasonable, including that the current price of and demand for commodities will be sustained or will improve, the supply of commodities will remain stable, that the general business and economic conditions will not change in a material adverse manner, that financing will be available if and when needed on reasonable terms and that the Company will not experience any material labour dispute, accident, or failure of plant or equipment. These factors are not, and should not be construed as being, exhaustive. Although the Company has attempted to identify important factors that would cause actual results to differ materially from those contained in forward-looking information, there may be other factors that cause results not to be as anticipated, estimated, or intended. There can be no assurance that such statements will prove to be accurate, as actual results and future events could differ materially from those anticipated in such statements. All forward-looking information contained in this document is qualified by these cautionary statements. Readers are cautioned not to place undue reliance on forward-looking information due to the inherent uncertainty thereof.